The process of promoting your business (Product, Brand & Services) online is known as internet marketing. Majority of people now a days promoting their business online! Why don’t you? Through internet marketing you can promote your business to millions of targeted people as it is a global media. Effort in terms of money is less to promote online when compared to local marketing, but it merges creative and technical process like design, advertising, development & leads. In web you can easily analyse the volume and profit that you have invested using various web analysis tools. There are many ways to promote your business online, but you need to choose the best that suits your business in terms of time and money invested. Lets see what are the types of internet marketing, but before that having a website for your business is must when it comes to internet marketing, even your site visitors can become promoters if you offer good product and service. 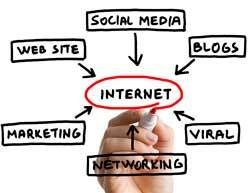 Lets see the types of internet marketing to promote your business. Promoting your business in social networks like Facebook, Twitter, Google+, Linkedin and more is social media marketing. You can attract more people from social networks as there are millions of people connected. There is two types one is you can get your free business page and the other is premium page or paid ads on these networks. This is contrary to search engine marketing. Its free!, but you need to promote your webpage in search engine raking pages(SERPs) for specific keywords. For this you will be needing more SEO skills to play with your competitors. There are more SEO services around web you can hire. First of all E-mail marketing enhaces the relationship between customers and company. For this you need a cool company profile with news-letter subscription. Customer who subscribes receives latest news and features about the company and so you get more business leads. This also is an inbound marketing. Paying an online retailer or a E-commerce site that helps leads to your business is known as online affiliate marketing. This type of marketing is more helpful because the seller or promoter gets a reward for promoting your business. Placing your company banners ads in other websites or blogs for brand awareness is display advertising. Offer promotional videos in your site and video sites like YouTube, Vimeo. If the video is informative then you will get targeted traffic which gives long term conversions. For video marketing you don’t need to spend money. Share your ideas and comments so we can explore more types of internet marketing.